How does one get dimens.xml (sw600dp) into Android Studio? 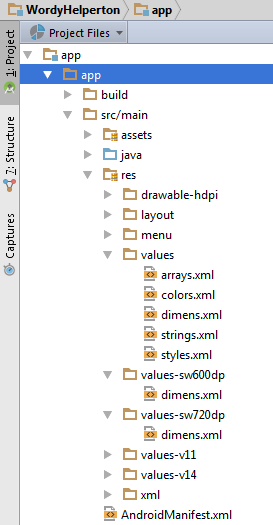 I inherited the values folder structure shown below. 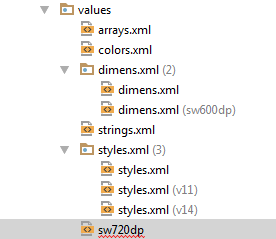 For over an hour I've Googled and looked and pulled down menus in Android Studio 1.2.2 and tried creating files and folders but nothing I have done lets me add, for instance, dimens.xml (sw720dp). I deleted dimens.xml (sw720dp - landscape) because landscape didn't suit my needs. 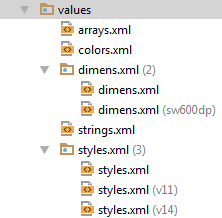 What steps did whoever created the folder structure take in order to get dimens.xml (sw600dp) to appear in the structure? What steps do I need to take to get a dimens.xml file with the sw<N>dp file naming convention? How do I get dimens.xml (sw720dp) where it belongs? You can ignore the rest of this. I'm just showing that I've TRIED stuff, none of which works right. Am I supposed to right-click values or dimens.xml (2)? What then? IT CAN'T BE THIS HARD. 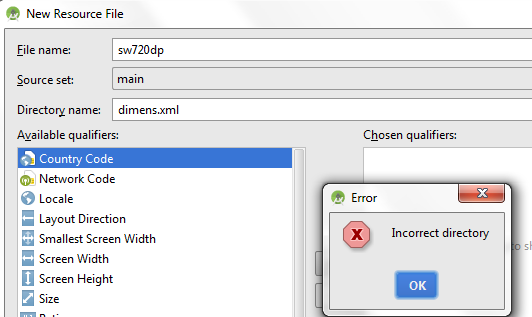 What steps do I need to take to get a dimens.xml file with the swdp file naming convention? First, you will probably be happier with life if you change the drop-down above your project tree from "Android" to "Project", which shows you an actual filesystem view of your project. 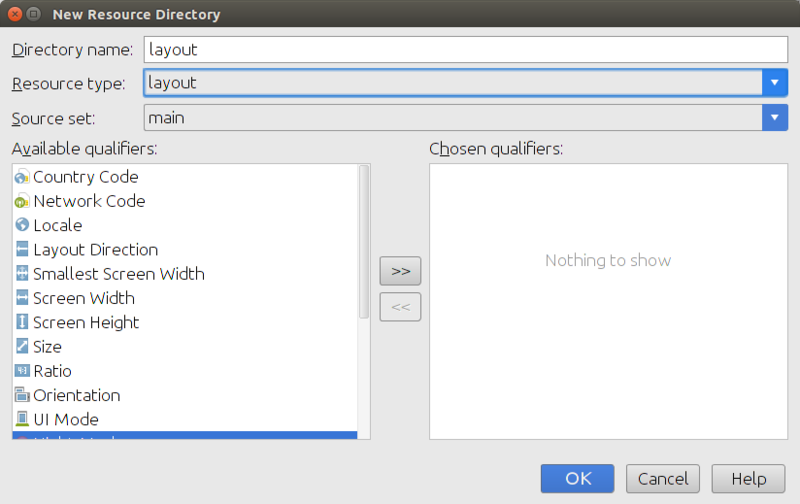 Click on your desired qualifier (in this case, "Smallest screen width") in the "Available qualifiers" list. 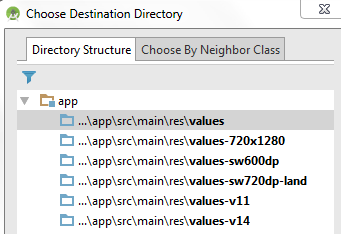 To add dimens.xml to that directory, right-click over the newly-created directory and choose New > "Values resource file" from the context menu. I will now see how @Commonsware says I could have done it. And as always, @Commonsware bailed me out with good advice (I have no idea when or why or how I lost the File structure "tab" along the left margin). Not the answer you're looking for? 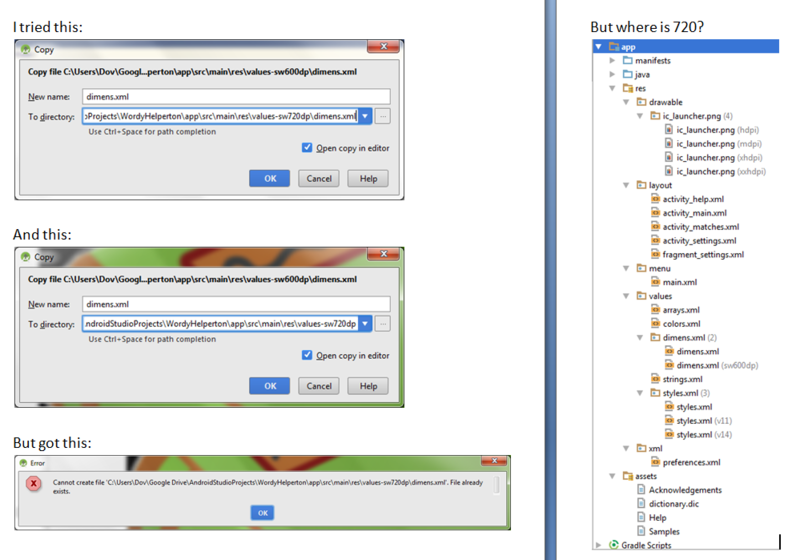 Browse other questions tagged android xml android-studio or ask your own question.